Crock Pot Low Carb Pizza Casserole is outrageously cheesy and good. It’s like a pizza without the crust. And you won’t miss the crust one single bit. 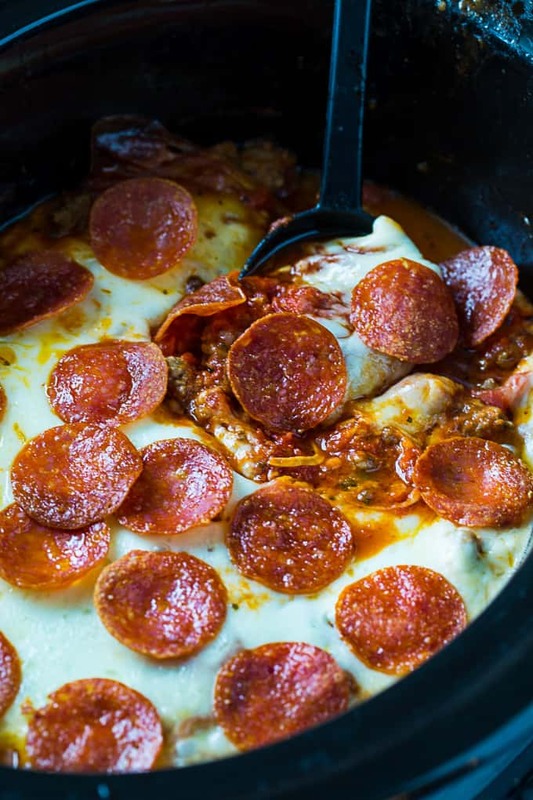 This is a super meaty Crock Pot Low Carb Pizza Casserole with plenty of protein. There’s both ground beef and ground sausage plus pepperoni. There’s tons of cheese too. Two kinds- mozzarella and provolone. There’s a little prep work for this recipe but it doesn’t take long. You need to brown the ground sausage and ground beef before placing it in the crock pot. The fat gets drained off and then the onions, peppers, garlic and tomatoes get added to the sausage mixture and cooked until the onions and peppers are soft. Transfer the mixture to a 6-quart slow cooker. Mix in 2 cups of shredded mozzarella cheese. Pour the jar of spaghetti sauce on top and cover with a layer of provolone cheese slices. Top with pepperoni slices and cook on LOW for 3 to 4 hours. So, so good. Great served with a green salad. 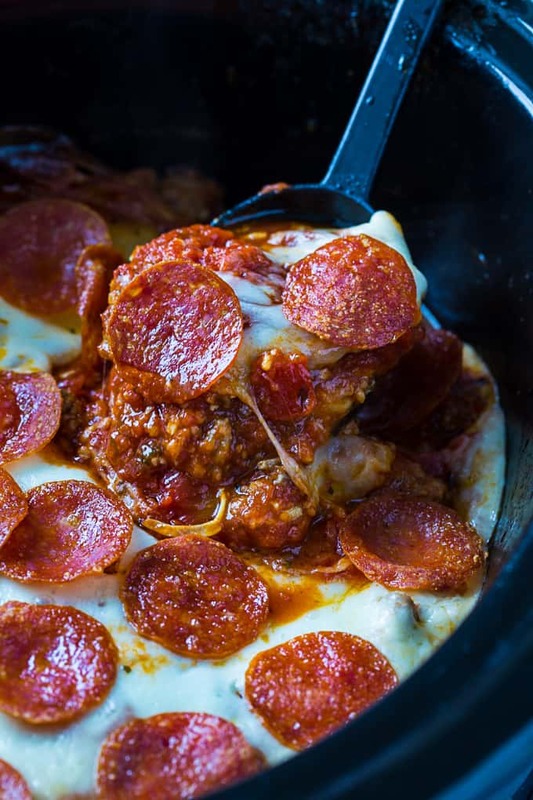 This Crock Pot Low Carb Pizza Casserole is totally customizable. You could leave out the sausage and double up on the ground beef. Or you could leave out the peppers and add mushrooms or olives. Add jalapenos or crushed red pepper flakes to spice it up some. A little Parmesan cheese would be good too. Mozzarella cheese can be used instead of provolone. 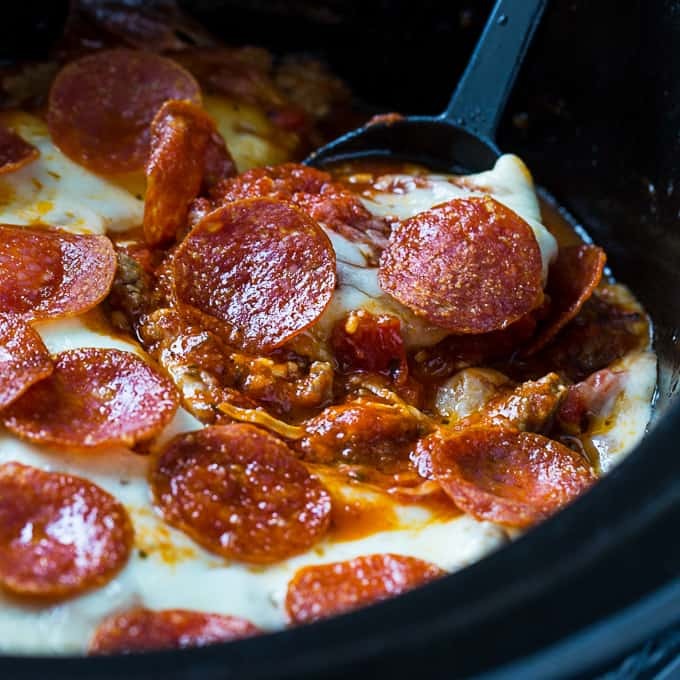 Crock Pot Low Carb Pizza Casserole is outrageously cheesy and good. It's like a pizza without the crust. And you won't miss the crust one single bit. Brown ground beef and sausage in a large pan, breaking it apart as it cooks. Drain off fat. Place pan over medium heat and add the onion, bell pepper, tomatoes, oregano, and garlic. Cook until onion and bell pepper are soft. Season to taste with salt and pepper. Transfer mixture to a lightly greased crock pot. Add mozzarella cheese and mix it in. Pour pasta sauce on top of ground beef mixture. Layer provolone slices on top. 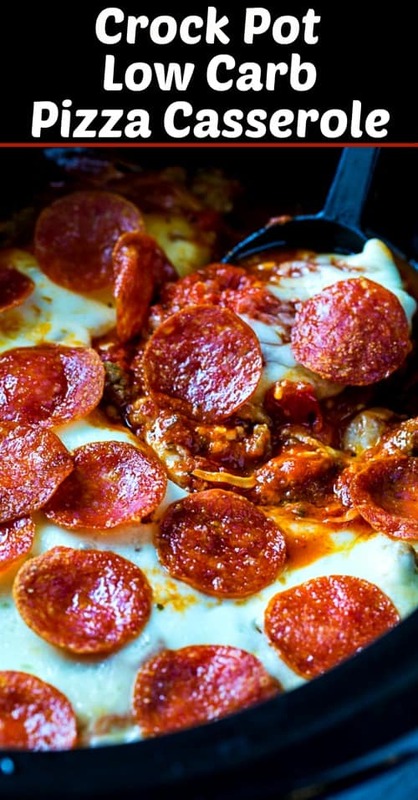 Layer on pepperoni slices. Cover and cook on LOW for 3 hours. This recipe is amazing!!!! Being gluten free this totally allows me to enjoy the flavors of pizza without the stomach ache and my family LOVES it!!! Thank you!